In this Christmas Gift Guide, we give you innovative and unique ideas for home and office. You’ll find cool gadgets, furniture pieces and devices that will make things easier. They are also nice additions to any living or working area. With the LapPad, you can move your devices from place to place with no hassle. 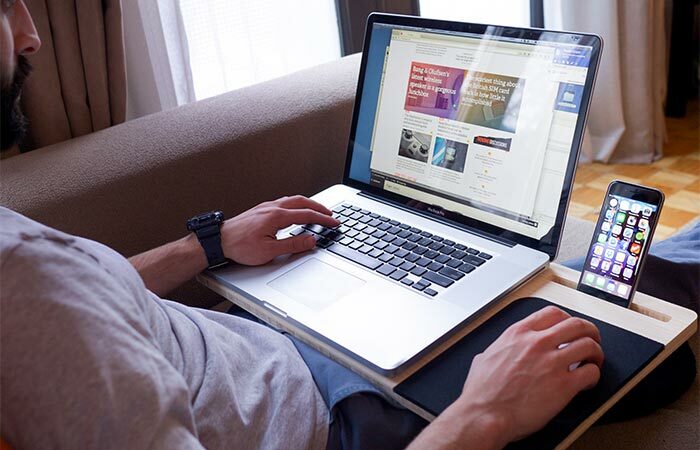 LapPad is a mobile workstation for laptops, smartphones and tablets. It’s a perfect gift for all who work from home and would like to add a bit of diversity into their workspace. It can fit various models of tablets and smartphones and laptops up to 17″. The LapPad is made of high-quality bamboo, that’s both strong and light and will keep the laptop from overheating. There’s a handle incorporated into the design, to make carrying it easier, and a special port for charging cables. Backjoy will make sitting more comfortable and support your back. If you spend a lot of your time sitting, you probably know you should straighten up your back. But we can’t always pay an eye on our sitting position, that’s why it’s great to have something like the Backjoy. This special seating device is something between a cushion and back-supporter. It will engage your muscles, stabilize hips and pelvis and ensure healthy breathing. It’s waterproof, so you can use it both indoors and outdoors and it will keep your posture straight when sitting on any given surface. This lamp has a USB port, so you charge your phone. This lamp isn’t like any other lamp. First of all, it has LED lights that lower power consumption and last much longer than other lights. It has several pivots, so you can put it in basically any position you need, whatever the size of the desk is. 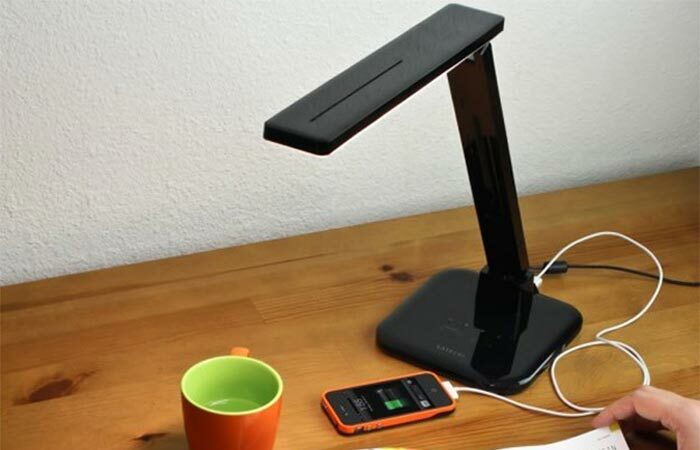 On the back of the lamp, there’s a USB port for charging phones and other devices and a timer, that will switch off the lamp, after a period of inactivity. It comes with four operating modes that are set using touch screen controls and each one with a different purpose. You can get it in two colors- black and white. Fuut Hammock is easy to set and has two levels. 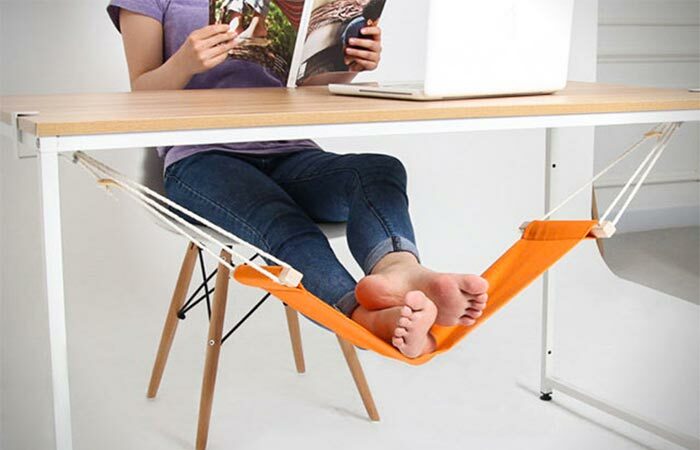 Fuut Hammock is a very innovative solution for putting your feet up when sitting. It can be used in any office, under the desk. It’s completely adjustable and made of canvas, ropes and clips. Fuut Hammock is great for relaxing your feet, back, and legs and it can be used in two different settings. There’s the work setting, that lowers the hammock, and the rest setting, where the hammock is raised. You can get it in six different colors- navy, yellow, orange, olive green, pink and white. Powerqube can charge up to nine devices. Powerqube is an amazing power-charging system that allows you to charge up to nine devices at the same time. It can be used for phones, laptops and different small household appliances. 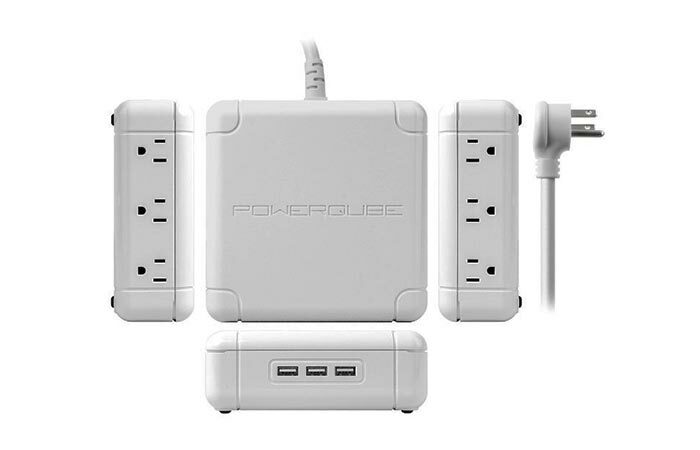 Powerqube has three USB ports and six electrical sockets. It’s very efficient, compact and comes with a five-feet-long cable so you can put in anywhere in your office or home. 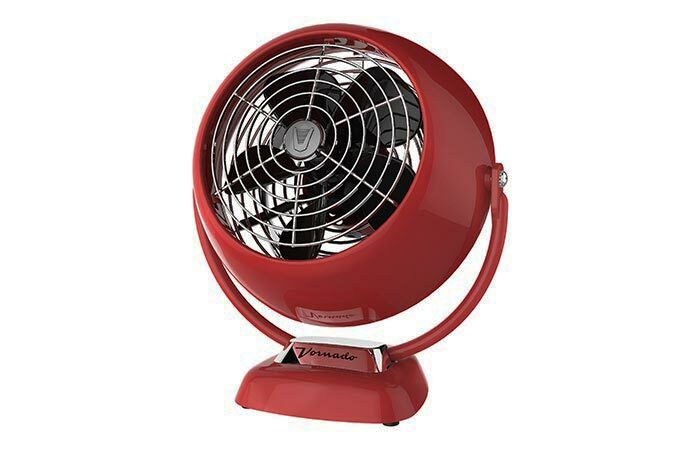 6 – Vornado VFan Jr. This small fan has a great performance. If you live in a place where it’s always hot, or you’d like to invest in a great device for summer, check out Vornado VFan Jr. It’s small and offers great performance. It comes with two-speed settings and has a full action pivot head that enables it to move in different directions. This fan is very quiet and looks a bit vintage. You can get it in three colors- chrome, green and red. 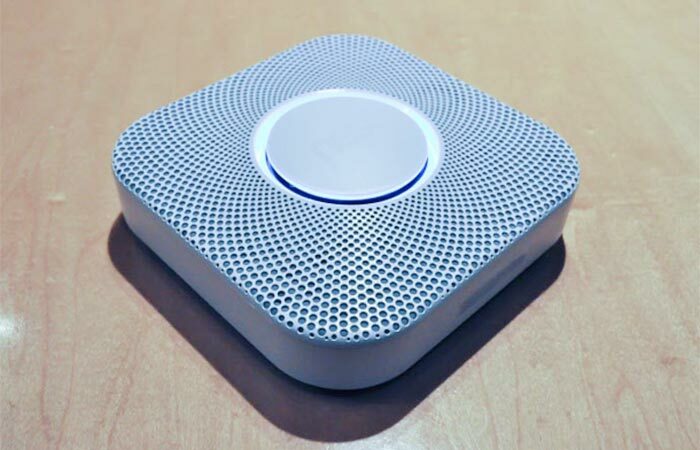 Awair monitors and increases air quality. 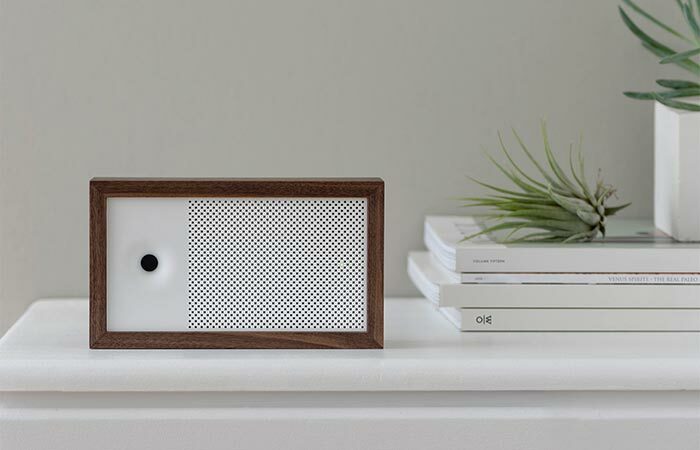 Awair is an air quality monitor for your home or workplace. It pays attention to different air quality metrics like temperature, humidity, levels of dust, CO2, and Volatile Organic Compounds. Then, it calculates an Awair Score, which is an overall score of the air quality. You can also set it depending on purpose, for example to increase productivity, help with allergies or sleep. You can connect it with other similar devices via WiFi and they can work together to increase air quality. 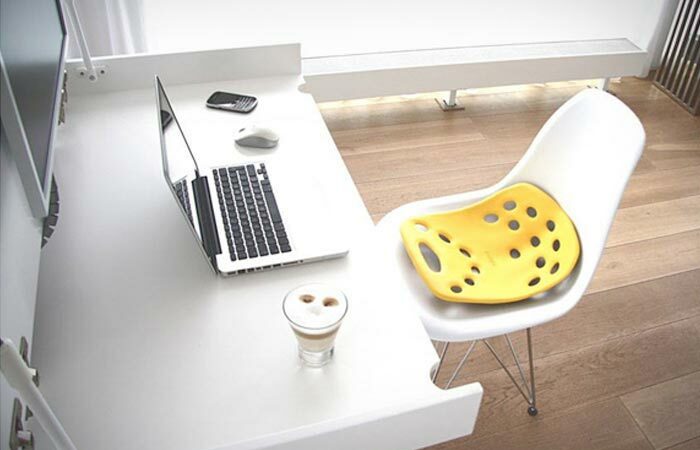 Balance Ball Chair helps you help you straighten your back. 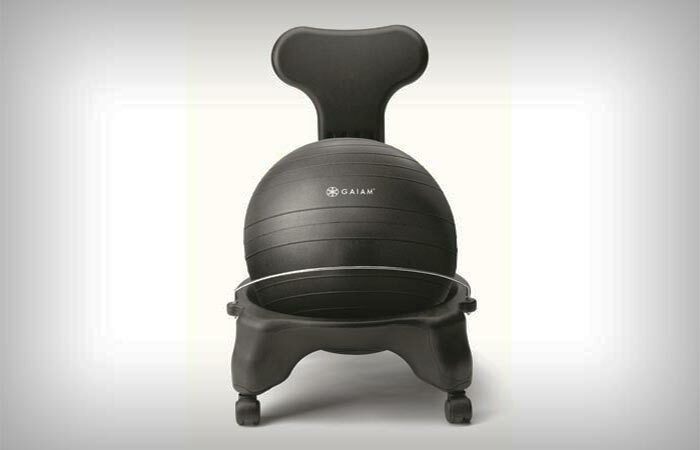 The Balance Ball Chair is a great way to exercise, and yet to sit still. It will help you straighten your back, strenghten your core muscles and improve posture. You can find many examples of stretches and exercises you can do with the Balance Ball Chair, and different cross-training moves that can reduce belly fat. It’s easy to assemble it, you can get it in different colors and it comes with a special air pump for the ball. These bookends create an optic illusion. This is an awesome gift for anyone who likes katanas, action movies, and oriental culture. This bookend is shaped like a katana sword. 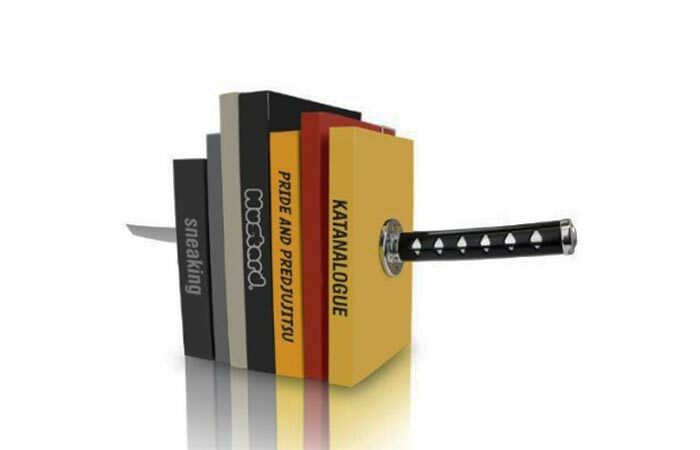 It has hidden brackets that will create an illusion that a katana is actually going through the books. You can frame your favorite read with it, or CD collections. Lull is a diffuser that lasts much longer than similar devices. 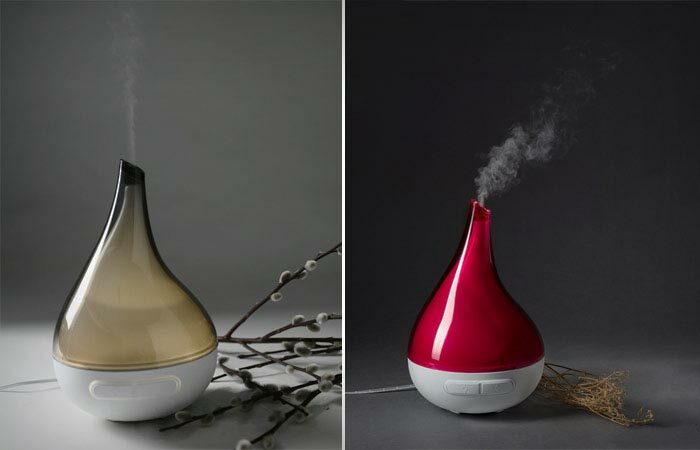 Lull is an aromatherapy diffuser that uses the latest ultrasonic technology to diffuse essential oils. It preserves all the qualities of essential oils and doesn’t use heat. All you need is water, and a few drops of your favorite essential oil and Lull will freshen and purify your air and soothe both your body and mind. It has a pretty large reservoir, so it will last longer than other air fresheners. It can last up to 10 hours. You can set different levels of brightness, like the breathing mode, where the light fades slowly. Satechi F1 Smart Monitor Stand is adjustable, has USB ports and audio jacks. 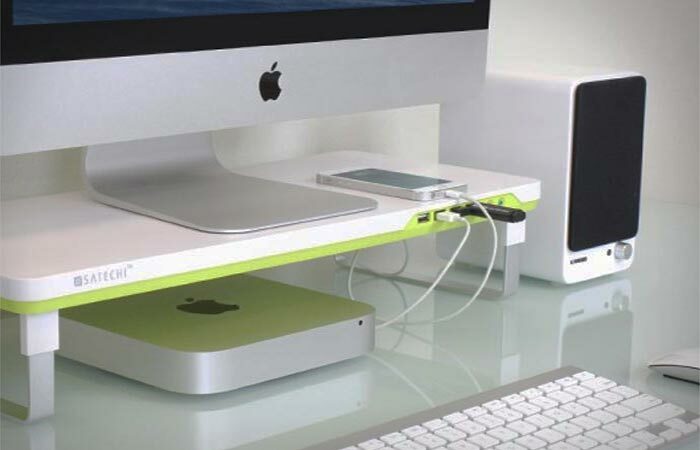 Satechi F1 Smart Monitor Stand will keep your desk clean, neat and well-organized. It can easily fit the screen and has four USB ports that allows you to quickly transfer your data. It also has two integrated audio jacks for headphone and microphone. You can adjust the height of it between 2 and 3.1 inches, and can fit screens that are up to 22 pounds in weight. This shower curtain looks very cool and is easy to clean. If you want something cool for your bathroom and like London, this shower curtain is just the thing. 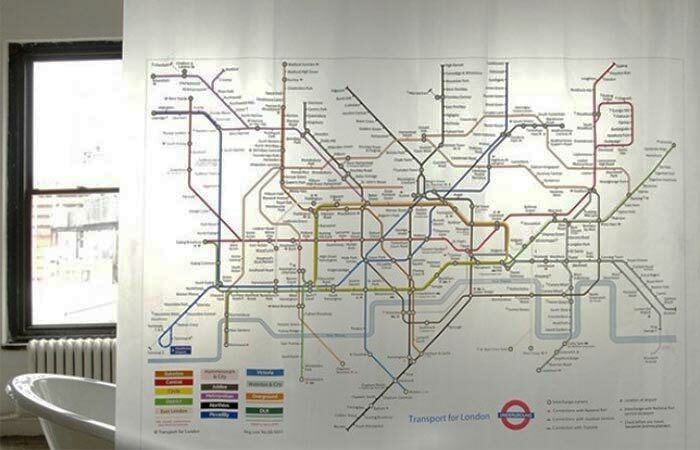 It shows up-to-date plan of transport for London’s tube. It’s made of 100% biodegradable PEVA vinyl that’s odorless and it’s very easy to keep it clean. All you have to do is wipe it with a damp cloth. You can also get the one with Chicago and Boston transportation system. This Phone Booth Cabinet is a unique way for holding books, magazines and CDs. This London-themed piece of furniture looks very cool. It can be used as a very unique way for storing books, magazines and CDs. 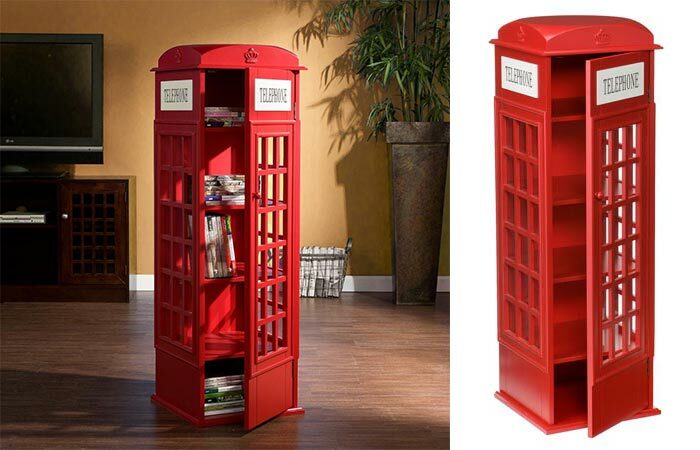 The Phone Booth Cabinet comes in recognizable red color and has five shelves and windows on three sides. It’s also very easy to assemble it, just follow the instructions that come with it. Since it can store up to 290 CDs or 136 DVDs, it’s a perfect place for entire media collection. Nest Cam has HD quality picture, wide angle and zooming options. 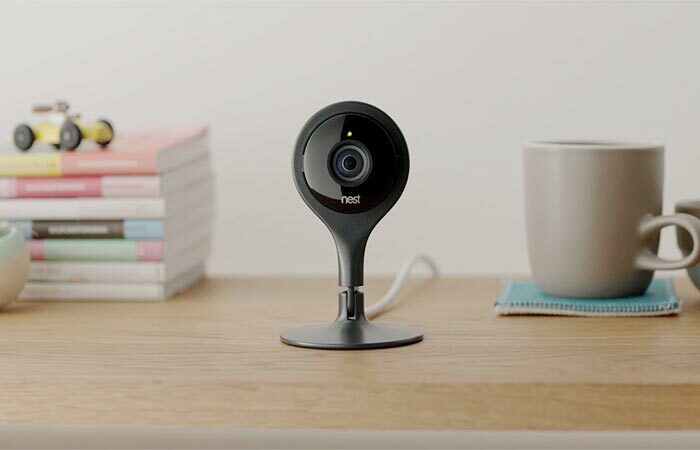 Nest Cam is an HD security camera that allows you to stream 1080p HD videos on your phone. It has 130° wide­-angle view with zooming options. It has a magnetic stand, so it’s great for metallic surfaces, but it can be also hooked on any wall or placed on a flat surface. Nest Cam is equipped with night vision, a microphone and will use an app to notify you each time there’s a sound or a movement in the room. Nest Protect protects your home from smoke and Carbon Monoxide. One more device you can use to protect your home or office is the Nest Protect. It’s a smoke and Carbon Monoxide alarm that works on batteries. It doesn’t have an annoying alarm, but speaks to you in English, Spanis or French. It will tell you when there are any changes or when the battery needs to be changed. You can control it via an app and wave your hand above it to turn off the sound. Nest Protect also has a green light that will detect your movement and light your way when it’s dark. Fluidstance Level is great for working your muscles. Fluidstance Level is a platform that allows you to work on your shape and keep your body moving. It will increase the mobility of your muscles 20 times more than the regular standing position does. 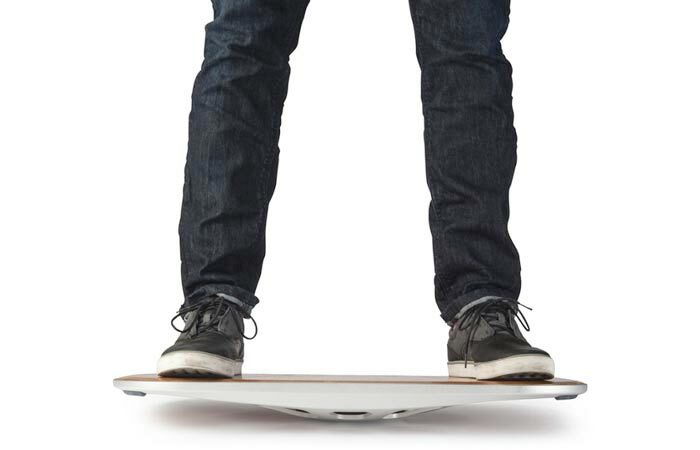 As you shift to maintain balance, Fluidstance Level will work your lower body muscles. You can use it in any kind of workspace, at home and on any given surface. It won’t take much space, so it’s easy to store. 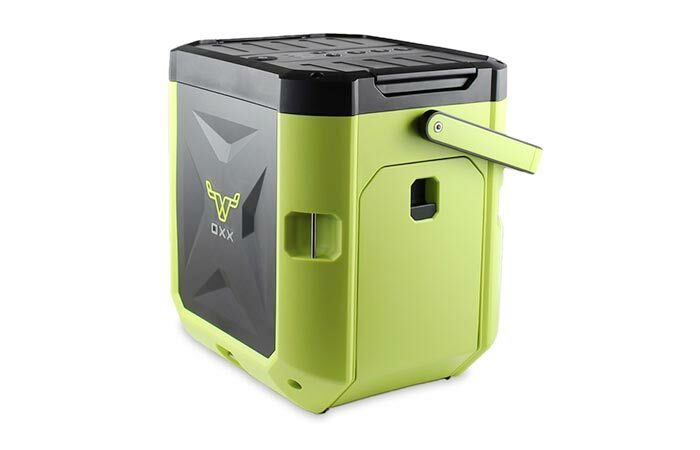 Coffeeboxx Portable Coffee Maker is the toughest coffee maker there is. Coffeeboxx Portable Coffee Maker is a perfect gift for all those who want to enjoy their coffee outside. It’s especially practical for workshops, offices and construction site workers. It will brew coffee in under 90 seconds. This coffee maker is so durable, you can literally drive your truck over it, making it the toughest coffee maker out there. It has a capacity of 85 oz. You can store it anywhere since it’s spill proof and water and dust resistant. Workfit allows you to switch from sitting to standing when you’re working on your computer. Workfit is a movable platform for your computer. It allows you to switch from sitting to standing in no time. It can easily fit any desk and you can adjust it in a way that makes your computing most comfortable. 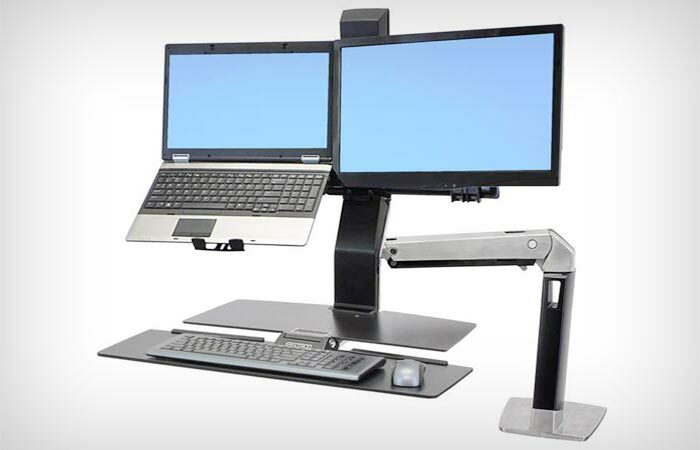 This workstation will help you stay in shape, stop slouching and make your joints less stiff. You can easily assemble it because it comes with a simple instructions manual and necessary tools. Gravity Balans Chair has three positions. Gravity Balans Chair is practical, safe and very relaxing. You can set it in three different positions. The first one, the most upright one, is suitable for proper posture and an office. The second one puts you in the middle position, that’s perfect for reading and watching TV, and the third one is the one you will love the most. 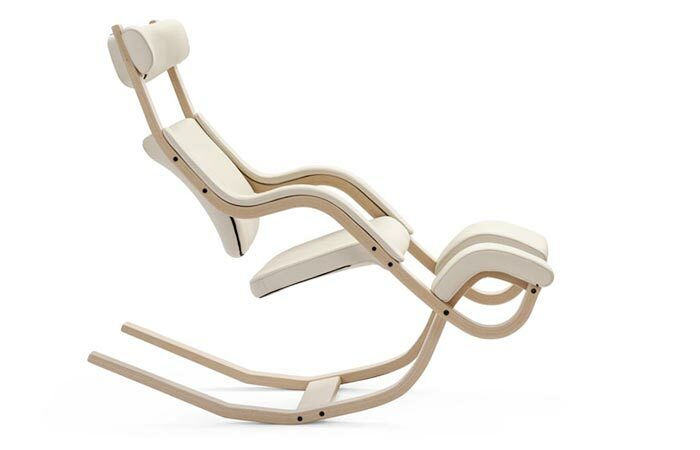 It defies gravity, and you can use it for a nap and full relaxation.